The groom figurine is dressed to the nines in his wedding day tux, but is carrying his golf bag, wearing his golf shoes, and checking his watch – hoping he has time to hit the links before the wedding. 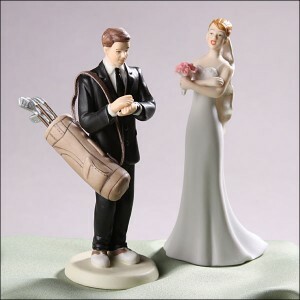 We found this adorable cake topper at the WeddingDepot.com. You can also find other sport-inspired cake toppers there including baseball, football, and fishing.